Mapping the future potential of your market trends is vital for the planning of any business. 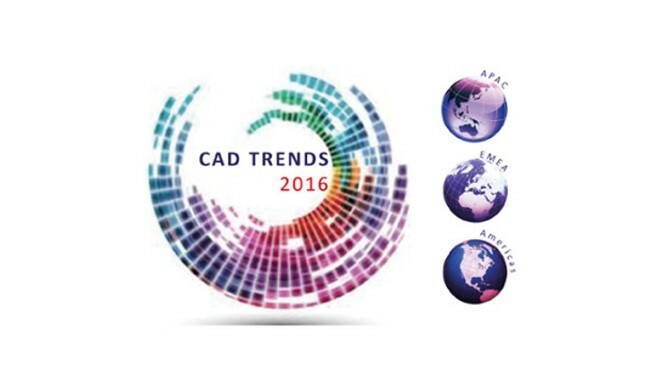 This annual CAD Trends survey of design, engineering and management professionals is designed to assist CAD, CAM, CAE, PDM and PLM users and software developers with their planning for 2016 and beyond. The report identifies opportunities in the CAD market and ranks their growth potential over the next 5 years. In addition because this is the third year we have conducted this survey we are now able to show actual data for the last three years as well. 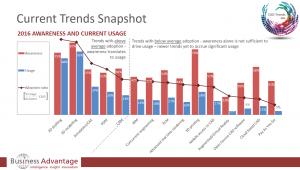 For those with a deeper interest, many insights are available within the full data set, for example by trend, usage, adoption, region, industry or CAD software vendor. Please contact us for further information. Strongest growth potential is in ‘Pay As You Go’, ‘Cloud based CAD’, ‘Augmented/Virtual Reality’, ‘Mobile Access to CAD’, ‘Advanced real time Rendering and Visualization’ and ‘3D Printing’. 3D Modeling is widely adopted but 2D Drafting remains important. Two thirds of users still rate 2D drafting highly important (8, 9 or 10/10). 39% of design work produces 2D drawings, 27% 3D models and 34% both 2D drawings and 3D models. 2D drawings automatically generated from 3D CAD or BIM models are important as is more software development on 2D drawing. CAM software usage increased 37% in the last year. Almost 70% of those using or planning to use CAM think it is important to have machining instructions automatically generated from 3D CAD models. 6 in 10 of them also want to see more software development effort on CAD/CAM integration. A Clear ROI on CAD Software upgrades is demonstrated. Nearly 60% of CAD users are downloading 3D CAD models monthly, 50% of Manufacturing users download multiple times per month. There is a significant drop in those never downloading to just 10% of CAD users. What hardware is in use now for CAD and what will be used next? How do customers prefer to keep up to date with industry developments? Which are the most used CAD software packages? Which are the most used Collaboration tools? As interesting as these questions are, equally intriguing are the variations in results by country/region, industry, size of company and software brands. Over the years we have completed more than 650 market research, data analytics and consulting projects for many of the world’s leading CAD, CAM, PLM, PDM and CAE solution providers. The confidential results of those projects often reveal competitive advantages or strategies and naturally very few of these have been published. However we believe the contributions of CAD, CAM, PLM, PDM and CAE to productivity growth across many industries is vitally important and very interesting to many worldwide. For this reason we do an annual worldwide survey in our own name and share the results publicly, we hope you enjoy CAD Trends this year and look forward to your feedback. Naturally the report is a high level summary of insights gained from the data gathered and this series of blog posts enables us to add further detail but if you are interested in still more detail, such as information on the CAD Trends 2016 by region, industry or software vendor, give us a call to chat with a research executive about your needs.